(3rd August 2018, Hong Kong) – AnApp Blockchain Technologies Limited (“AnApp”), the IOTW blockchain developer, announces two key partnerships, with Consta Mobile, a telecommunications services and products supplier, and The California Wine Company Limited, a prominent Californian wine distributor for Thailand and other South Asian countries. Both partnerships represent major milestones for the promotion and adoption of IOTW blockchain technology, where mobile devices adopt our Proof of Assignment micro-mining protocol and The California Wine Company Limited accepts our IOTW coins for their sales. This way, mobile users can essentially mine the IOTW coins and purchase wine with it – a tangible example of how the IOTW ecosystem works. Cryptocurrency mining has traditionally been a resource-intensive process, requiring significant processing power and energy. As such it is now concentrated in the hands of a small number of professional players. The IOTW blockchain technology is a completely new architecture with an innovative consensus protocol called Proof of Assignment, which allows IoT devices, no matter how simple they are, to easily mine IOTW coins without the need for any hardware change. The IOTW blockchain is developed for the common people around the world. Consta Mobile is committed to innovation in telecommunications, focusing particularly on developing a network for rural and remote areas to bridge the digital divide and promote socio-economic development. The company is planning to sell their mobile devices in the emerging Indian market first, followed by other counties, and partnering with IOTW will allow Consta Mobile to integrate low-power mining functionality into mobile devices, whereby device owners will be able to mine IOTW coins on the go. The California Wine Company Limited will be accepting IOTW coins as payment for products in their extensive wine collection. Given the fact that the company is, by far, the largest importer of California wines in Thailand, the partnership will further promote the IOTW ecosystem and accelerate its growth and mass adoption. Commenting on the new partnerships, Mr. Frederick Leung, co-founder and CEO of AnApp said, “We are excited to be forming partnerships with Consta Mobile and The California Wine Company Limited. We are currently working on more partnerships with world-leading names and will be announcing them in the near future. 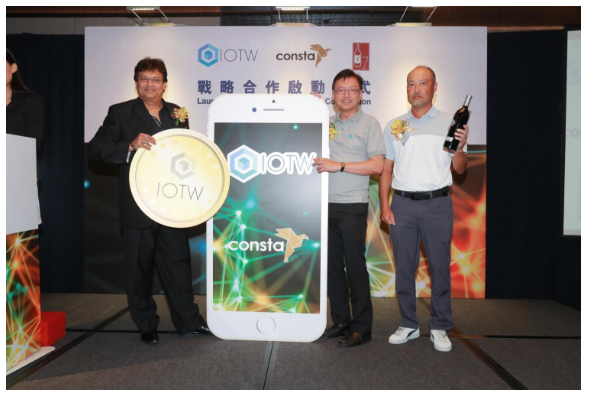 A collaboration with Consta Mobile is a strategic step for IOTW to penetrate the mobile devices market, implement our unique micro-mining solution and move towards mass deployment of our chain. Mr. Madhu Bhandari, the Managing Director of Bramaas Holding Group (parent company of Consta Mobile), said, “Our mission at Consta Mobile is to introduce innovative products and services. We are dedicated to building a robust and secure state-of-the-art telecommunication network, providing seamless coverage with special focus on rural and remote areas for bridging the digital divide and thereby facilitate socio-economic development. AnApp Blockchain Technologies Limited (the IOTW blockchain developer), Consta Mobile and The California Wine Company Limited have successfully formed strategic cooperation partnership, embarking on the journey towards the IOTW ecosystem. AnApp (website: iotw.io) is developing the IOTW cryptocurrency and blockchain software which can run on different IoT devices. The micro-mining software can be embedded into different IoT chipsets and also downloaded into existing IoT devices through a firmware update. For additional information, please email pr@anapphk.com. Consta Mobile (website: consta.io) was founded in 2014. It is focused on developing a telecommunication network providing seamless coverage, particularly in rural and remote areas. The company’s mission is to promote socio-economic development in developing economies and bridging the digital divide. The California Wine Company Limited (website: ca-wine.com) was founded in 1996. It focuses on distributing California wine throughout Thailand. To this day, The California Wine Company is by far the largest importer of California wines by representation with over 50 labels in their portfolio.